As tensions over slavery led to sectional crisis in the first half of the 19th century, Princeton’s commencement addresses became increasingly pro-slavery in tone. College commencement ceremonies hold a distinctive significance in American culture. More than simply bringing closure to a college education, commencements symbolically shepherd new graduates into “the real world.” At the College of New Jersey (now Princeton University) commencement speakers sought to inspire graduates to take up roles as public figures, responsible for leading their country into the future. The influence of educated men in the United States is more potent for good or evil, than similar influence ever before has been…every one of us, within his sphere, can do something to guide popular opinion — to enlighten popular sentiment — to promote general intelligence and happiness. Graduates of the College of New Jersey had a responsibility to go out into the world and create a society based on the values their studies had instilled in them. The rhetoric and rituals of the college’s commencement ceremonies — connecting past and present, classroom and real world, thought and action — expressed and legitimated particular moral, social, and political philosophies intended to guide new graduates in their endeavors beyond campus. From the turn of the 19th century through the years of sectional crisis leading up to the Civil War, Princeton’s commencement speakers repeatedly drew their audience’s attention to the pressing issue of American chattel slavery. As the college’s faculty and students grappled with the possibility of emancipation and the perceived threat it posed to national unity, commencement speeches became increasingly pro-slavery in tone. Echoing the bitter debates over slavery that would unfold in churches, assembly halls, legislative chambers, courts, and learned academies across the nation during the course of the 19th century, these early addresses and debates on Princeton’s campus ushered in a wave of slavery-focused commencement commentary that grew increasingly dramatic in the decades preceding the Civil War. The light of American freedom now shines as a beacon to many afar off; a star of hope to the affrightened, of gladness to the benevolent, and of encouragement to the oppressed of the earth. "The Bible is to be pronounced a cheat, Christ to be proclaimed an imposter...the sabbath is to be abolished; marriage to be despised; the present framework of society will be totally disorganized” as the ownership of “property [is] declared theft." A consummate mid-19th-century culture warrior, Kaufman maintained that the American nation built around slavery was unimpeachable; in fact, the nation was “the great college of liberty for the whole world.” The end of slavery, he claimed, would bring first “Communism” and “Socialism,” then ultimately “anarchy, and bloodshed [to] close the bloody picture!” American “liberty” and “freedom,” Kaufman made clear, depended on the enslavement of the 3.2 million African Americans counted in the 1850 United States census. With such twisted logic, anti-abolitionists used opportunities like commencement addresses to forward the notion that American freedom and democracy were not only reconcilable with but indeed reliant on human slavery. A pro-slavery address delivered by David S. Kaufman (class of 1833) at the Princeton commencement for the class of 1850. It has not been the destiny of Princeton College to prove a nursery for the ultraists, the agitators and the fanatics of the day […] but when the maintenance of great social institutions is concerned, when a conception of the grand foundations of national polity is demanded to prepare the world for safe and steady advancement, and advance it when prepared, has been the proud mission of our college. The ascendance of anti-abolitionist rhetoric at at commencement ceremonies rendered the meaning of this statement unmistakable. Throughout the antebellum period, Princeton’s commencement speakers used this final chance to shape undergraduate minds as an opportunity to articulate the college’s stake in slavery and inculcate a pro-slavery worldview. We are at a loss to know which is the greater insult, the outery and kicks of the southern youngster or the letter of Dr. Carnahan. A day when old and young, white and black, male and female, rich and poor, learned and unlearned, good and bad, all the extremities of character and condition meet and spend a day together at Princeton, hearing seeing and doing a little of every thing but nothing of any importance. If the Whig was correct in its assessment of the various social interchanges that occurred in the midst of commencement celebrations, the paper’s harmonious description completely ignored the real possibility of conflict and violence that troubled the College of New Jersey’s cloistered world. But that dissonance also provided a reason to hope. Despite decades of pro-slavery rhetoric and deeply-held conservatism on the part of the college’s administration and commencement speakers, the presence of leaders like Wright — who would go on to play a key role in the abolitionist movement — suggested that perhaps Princeton’s orators inspired at least some individuals in their audience to fight for a different vision of their nation’s future. The annual commencement festivities marking graduation at the College of New Jersey brought the college and the broader community together for several days of speeches and ceremonies. In 1748, commencement was held in November. From 1749 until 1843, the event was held in September. From 1844 until the present, commencement activities have taken place in June. Samuel L. Southard, An Address delivered before the Alumni Association of Nassau-Hall, on the Day of the Annual Commencement of the College, September 26, 1832 (Princeton, NJ: D’Hart and Connoley, 1832). 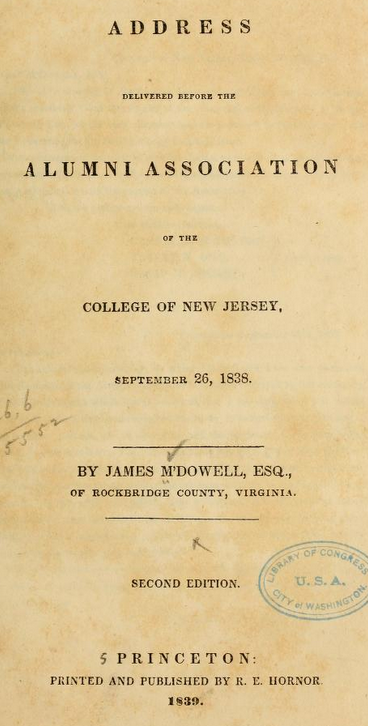 James McDowell, Address delivered before the Alumni association of the college of New Jersey: September 26, 1838 (Princeton, NJ: John Bogard, 1838), 46. Emphasis in original. “Commencement of the College of New-Jersey, September 25th 1839: Order of Exercises.,” Box 1, Folder 35, Princeton University Commencement Records; Princeton University Archives; Department of Rare Books and Special Collections; Princeton University Library. Alfred Brophy, University, Court, and Slave: Pro-Slavery Thought in Southern Colleges and Courts and the Coming of Civil War (Oxford: Oxford University Press, 2016), 206. William H. Gaston, Address Delivered Before the American Whig and Cliosophic Societies, 1835 (Princeton, NJ: R.E. Hornor, 1835), 31. “Kaufman, David Spangler,” Texas State Historical Association, accessed 14 March 2017, https://tshaonline.org/handbook/online/articles/fka12; “Commencement of the College of New Jersey,” Trenton State Gazette, 26 June 1850. 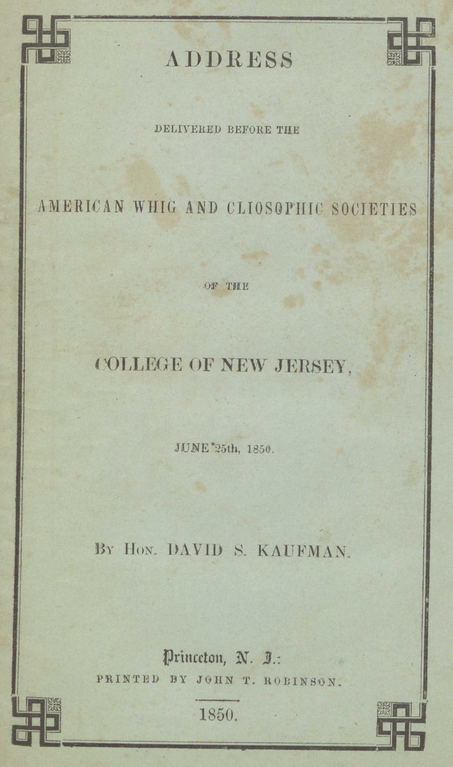 David S. Kaufman, Address Delivered before the American Whig and Cliosophic Societies of the College of New Jersey (Princeton, NJ: John T. Robinson, 1850), 17. 1850 Federal United States Census, accessed 14 March 2017, https://www.census.gov/prod/www/decennial.html. “Commencement Exercises: The 112th Anniversary of the College of New Jersey, June 29th, 1859,” and “Princeton College Commencement [Unidentified Newspaper Clipping],” both in Box 1, Folder 55, Princeton University Commencement Records; Princeton University Archives; Department of Rare Books and Special Collections; Princeton University Library. “Shameful Outrage at Princeton, N.J.,” The Emancipator, 27 October 1836, 102. “Commencement Day,” Princeton Whig Standard, 23 September 1836, 2.